Having been sequestered indoors for much of the last week (a tummy bug, thanks for asking, and I thought I might die at one point, I felt so awful), I was a bit peeved that the weather forecast for this weekend mentioned gale-force winds, heavy rain and possible snow. OK, the snow wasn't in the Midlands. But the rain and the wind have been. In fact, this morning the rain temporarily changed direction to hammer horizontally at our bedroom window, successfully waking me from my healing sleep. 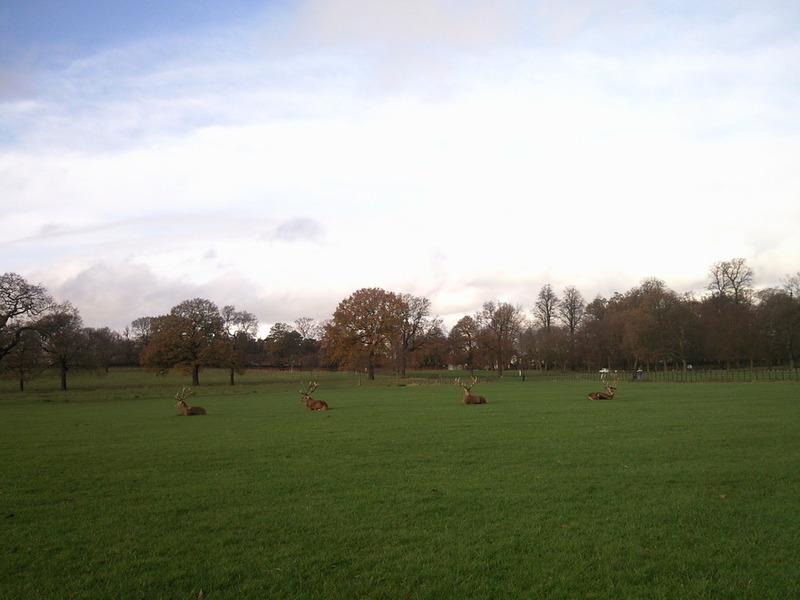 But by late morning, the rain had subsided and we were able to venture out for a brisk walk at Wollaton Park with Mavis, our temporary dog. She had a great time, and was thankfully pretty worn out by the time we came across these fine fellows, reclining on a grassy expanse amongst the copses and heavier ground. The few clouds which were building scudded across the sky, occasionally bathing them in sunlight, which they seemed to be enjoying. Mavis's tiredness meant she felt no need to round them up, which was a relief to both of us (and probably all the other spectators, too).